Award for SLCC president honors efforts to devote time and energy to improve quality of life for others and to assist women in reaching their full leadership potential. Pictured: Lane Beattie, Salt Lake Chamber CEO and president (l-r), SLCC President Deneece G. Huftalin and Lisa Grogan, Wells Fargo regional marketing manager. Salt Lake Community College President Deneece G. Huftalin received the 2017 ATHENA Leadership Award from the Salt Lake Chamber, Utah’s largest and longest-standing statewide business association, during its annual Women & Business Conference in Salt Lake City. 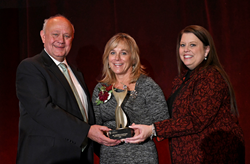 The ATHENA Leadership Award is a prestigious national award presented annually to an active member of the Salt Lake Chamber who demonstrates excellence, creativity and initiative in business. Each recipient must also provide valuable service by devoting time and energy to improve the quality of life for others in the community and assist women in reaching their full leadership potential. In her remarks, Huftalin also echoed the conference theme, “Brave & Bold,” saying that it is “an inclusive description of all who try, who take on a challenge, who speak their minds, who go against the grain at times.” She singled out two women in the room with SLCC connections, Kathleen Lopez and Alex Farmer, for being brave and bold in pursuit of their own goals. Huftalin also praised Gail Miller and Barbara Tanner for enhancing the community with their bold embrace and support of education and social justice. Huftalin was named the eighth president of SLCC in September 2014. Prior to her current role, Huftalin served as Salt Lake Community College’s Interim President, Vice President of Student Services, Dean of Students, and Director of Academic and Career Advising. In her tenure as president, Huftalin has launched a College-wide strategic planning cycle that has produced a new vision, mission, values, and strategic goals for the College. She is also leading efforts to strengthen completion rates, transfer pathways, workforce responsiveness, and equity in student access and completion. Huftalin also has taught in the Education, Leadership, and Policy program at the University of Utah and serves on a number of community boards and committees including the Salt Lake Chamber, Governor’s Education Excellence Commission, EDCUtah, Envision Utah, and Utah Campus Compact. Nationally, Huftalin serves as a Commissioner and Executive Committee member for the Northwest Commission on Colleges and Universities (NWCCU), a trustee for LeaderShape, and a member CEO for RC-2020, Inc.